As of December 15th 2017, the final two superbadges; Lightning Component Framework Specialist and Advanced Apex Development are now available so you can complete your PDII journey and get your hands on your well-deserved Platform Developer II credential! Don't forget, you'll need to complete the three prerequisite superbadges—Apex Specialist, Data Integration Specialist, and Lightning Component Framework Specialist—before you can unlock the final one—Advanced Apex Development. Plus, check out the Platform Developer II certification trailmix to help with your exam prep. The five words every Salesforce developer wants to add to their portfolio, and shout from the rooftops. It demonstrates to the world that you've got momentous mixology skills in both programmatic and custom development, and that you can build custom applications on the Force.com platform. It's the ultimate validation of your overall Salesforce dev mastery. 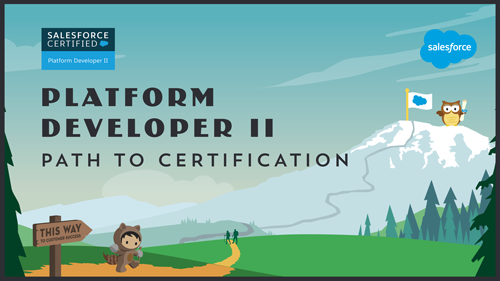 There's a whole new way to blaze your trail to becoming Platform Developer II certified and it's going to change the way you prepare for certifications forever! If you're an avid Salesforce learner, then you'll know all about Trailhead, the fun way to learn Salesforce. As well as trails with modules and projects, there are also superbadges—and these are now key to earning your PDII certification. Superbadges are skill-based credentials that showcase your Salesforce expertise. They provide you with a business scenario that you're then challenged to solve, and subsequently, build. If Trailhead badges represent what you’ve learned, superbadges prove that you can take what you’ve learned and apply it to solve complex business problems—the ultimate test of your knowledge in a real-world environment. 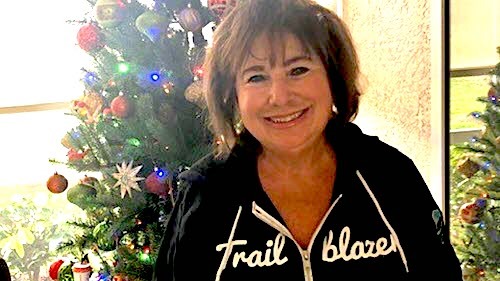 Since our entire reason for being is to empower you to learn and validate your Salesforce skills faster and easier, it makes perfect sense to deliver that learning on a platform that you already know and love. By bringing together the hands-on skill validation of superbadges, and the proctored security enforced by the Salesforce certification exam process, we're creating a magical new way for you to prove your complete understanding and prowess of Salesforce. A proctored multiple-choice exam—the same one that exists today. The completion of four defined superbadges—which replace the Programming Assignment—covering features, concepts, and scenarios that are essential for a Platform Developer to know, including Apex programming, data integration, Lightning integration and more. 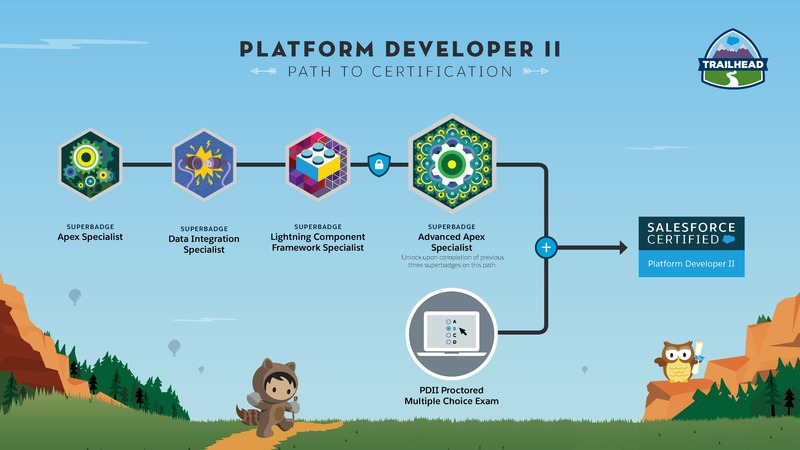 The Platform Developer I (PDI) certification is still a prerequisite, but now, PDII will be more accessible to the Salesforce developer ecosystem at large. Once you're Platform Developer I certified, you can start your adventure by deciding how you want to complete the requirements for the next step in your developer journey. Earn the superbadges, BTW, completeing the first three — Apex Specialist, Data Integration Specialist, and Lightning Component Framework Specialist — will unlock the final superbadge: Advanced Apex Development. It doesn't matter in which order you do the exam or superbadges, either way, a PASS on all above requirements is a must before you can take hold of the prized Platform Developer II credential. 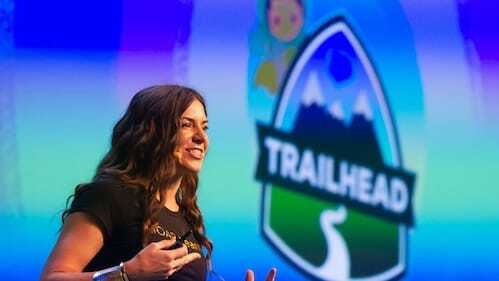 If you're ready to start blazing your trail now, simply log in to your Trailhead account, or sign up for one, and start working on those superbadges. And if you don't yet have the PDI certification, but have it in your sights, this is one of the great ways you can prepare and get some strong skill-based learning in. Then, when you're ready to climb higher, you'll already have some of the PDII prerequisites out of the way—bonus! 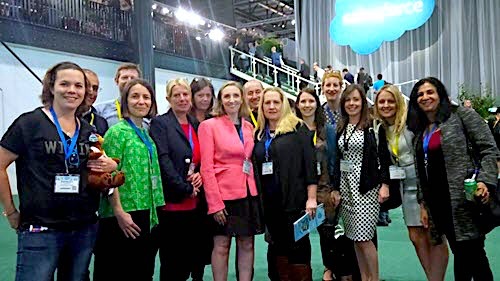 We're more excited than ever about the future of Salesforce certification and about delivering more scalable, self-service, real-time solutions to validate your expertise. Superbadges are the perfect partner to help us do that! If you'd like to learn more about the new PDII certification trail, check out the knowledge article for more details.